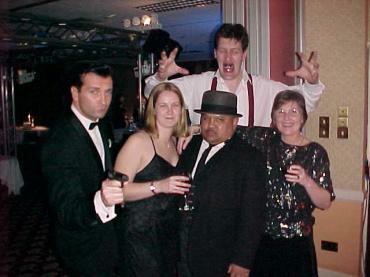 The event in the photo was for 200 people and took place at The Royal Bath Hotel in Bournemouth. 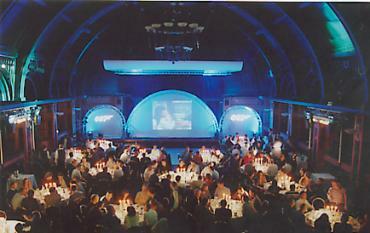 There was an ideal room for the event and a lighting and stage set was brought in. Bond films and the host's logo were played on the main screen and the two smaller screens had Bond logos or live dancers who cast a Silhouette on the screen. Lookalikes are another way to make an event special and all your guests will want to pose for a photo to remind them of their experience. This is a larger picture so you can see how good these guys are; Jaws is over 7 foot tall and just incredible. Call us for further information on this fantastic event that is guaranteed to leave you both shaken and stirred! The Ice Sculpture makes a fantastic centre piece. It is carved out of ice in the shape of a Walther PPK, 007's famous gun. It is also a Vodka Luge; you pour Vodka into the loading area, it runs down the barrel of the gun and comes out of the end into a glass beautifully chilled. Fantastic!